Wow , yes that's my review for this book . 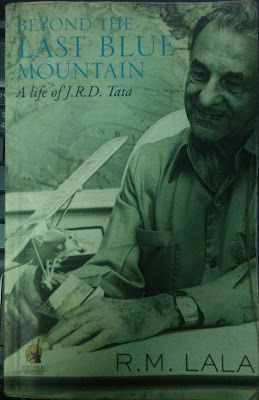 This is not just a book but a very well written document of life of J.R.D Tata . Reading this book has given me so many insights in life of i would daresay best businessman ,socially driven,adventurous, patriotic and motivated person in world. I was always curious to know the history behind Tata's and this book has given me good info . This book has presented the life of Mr. J.R.D Tata very effectively. First chapter gives introductory account of his family and ancestors. Starting from Mr.Jamsetji Tata who founded the First Steel Plant of India, University of Sciences and the first hydro-electric project in early 19th century during British Raj . Tata & Sons was established in 1987 by Mr. Jamsetji Tata, Son Sir Dorab Tata, Young Cousin Ratanji Dadabhai Tata(R.D) . Starting with his Jamsetji's introduction , Sir Dorabji ,Mr. R.D. Tata . It gives a fair idea of the strong foundation that was being built for Mr.J.R.D morally and in business. Mr.J.R.D was born on 1904 . He was named, "Jehangir" meaning the conqueror of the world. Well as you see he did :) . Very well documented information is given about the then political situations, France, India etc .This gives us idea in which scenario, environment and circumstances he came to this world. His early childhood and growing up , the industrial growth , starting of aviation .The excitement ,adventure, frenzy surrounded by Aeroplane and flying . His time in French army , his return to India . Then the story begins how he at the Age of 22 started to take responsibility for the business. His friends , relatives, colleagues, seniors , all have played a vital role in grooming Mr. J.R.D . His adventurism has been a significant factor in his decision making or risk taking . He has always handled the situations very well . It automatically developed into him. He was the First Indian to get the license from Aero Club of India and Burma on behalf of FAI . His certificate has "I" which was very special for him . This was beginning of something exciting for him and India. His liking for flying inspired him to create a business out of it . He started the Tata Air Lines in 1933 and after that it's a story in itself. I daresay , business was a secondary point in Jehangir for Airlines, He must have started the business so that he can officially fly around in his aeroplane with expenses covered. :-P Jokes apart but it was begining of an era of Aviation in India. J.R.D 's attraction was always towards flying . He handled all the businesses but Tata Air lines/Air India was always close to his heart , later which became Air India . There are lot of twists and turns to the story how his hand was forced to form Air India and takeover by Government . It's emotional , political ,strategic, letter exchanges all those situations are very well recorded . He headed many organizations in Tata group . Took up challenges to revive losses. This book gives very good account of his friends and friendship . He always stood by their side in good as well as bad times, in good health and bad. His letters reflect upon his communication skills. He always was good in communicating to people. His meeting , phone calls ,letters with politicians of free India , during British Raj everything is very well documented through his letters. His faith in people and their abilities, risk taking , perfectionism is reflected from his Air India Chairmanship . He brought the Air India a unique recognition and it was the best service provider in top world Airlines . He was the person who added that Saree can be adorned beautifully in glamorous air hostess roles instead of skirts or dresses alike. It gave that uniqueness to Air India . Wow, Writing this book review is so difficult for me, every part,chapter is important . I have learnt a lot from this book . Some things cannot be just defined in words, you just know it . Just go ahead read this book . Must read for Entrepreneurs,Businessman and passionate people. Find Real Estate Properties in Amaravathi at Apnahousing 2 BHK|3BHK Flats for sale in tadepalli Amaravathi , the best property site in Mangalagiri. Buy, Sell, Rent residential and commercial properties in vijayawada,Guntur,Tadepalli,Mangalagiri,Kaza,Andhrapradesh.